Use the filter to display only projects that meet the defined criterion. For more information, see Search and find projects. Expand or reduce the project list view Change the view by clicking Expand All or Collapse All to structure the project list. Choose Fields This feature sorts and organizes the project by selected data. On the Choose Fields dialog box, click one field, e.g. Budget critical, and drag it into the column headers. 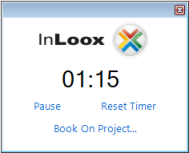 How to record personal working hours with the stopwatch in InLoox PM 7 • Copyright 1999-2019 © InLoox, Inc. All rights reserved.